Dave Weber has worked as a rescue technician, remote site medic and skills instructor for the last 15 years. He works as a mountaineering ranger on Denali and as the Lead Medic for Denali National Park, a critical care paramedic for Intermountain Life Flight, a lead guide for the Khumbu Climbing Center, an instructor for the American Avalanche Institute, the NOLS Wilderness Medicine Institute and Remote Rescue Training. 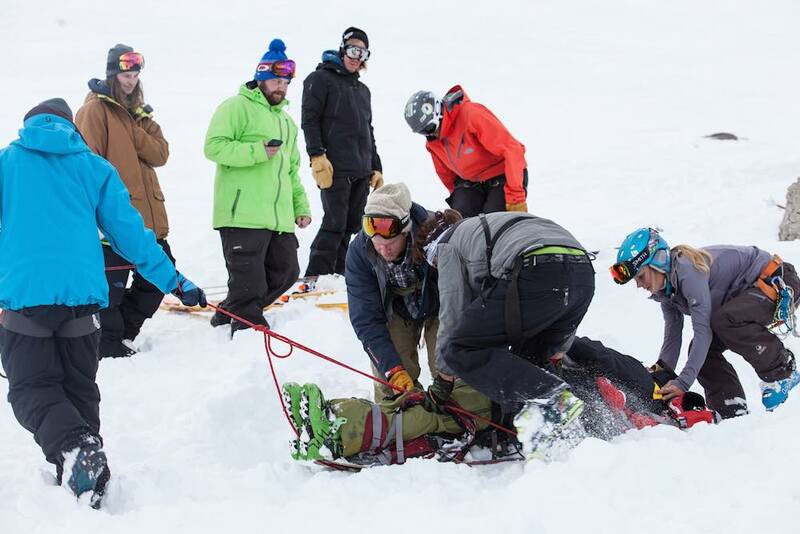 One of the highlights of his year is working with the TGR athletes and crew at the annual International Pro Riders Workshop, and while he couldn't make it to this year's event in Jackson Hole, to help us with our wilderness first aid content for Safety Week 2014 (see bottom of the article for links to more pieces), he did find a couple hours to answer questions from our forum members about every thing from proper rescue breathing technique, what kind of avalanche shovel to own, how important splinting is, and what outdoor adventures should know to rescue a stranger, a friend, or themselves. I think that an airbag is another tool for sure, but one that will never replace solid avalanche assessment skills and a beacon, shovel and probe setup. The best avalanche assessment/gut check prior to skiing a line is to ask yourself if you are willing to leave all of your avalanche gear at the top of that run. If so, you have probably spent a good amount of time focused on your assessment as you should. If not, you should probably rethink your decision making. I would have to say your brain Ryan. I think that you can improvise quite a bit in rescue as long as you are calm and attentive to the big picture. Almost Ablaze Lead Editor Blake Campbell sits in an arm splint made by turning his jacket up and pulling the drawstrings taught. Ryan Dunfee photo. No, I am pretty happy to help anyone that actually needs it and realize that we have all made dumb decisions in the backcountry in the past and have probably gotten away with it. 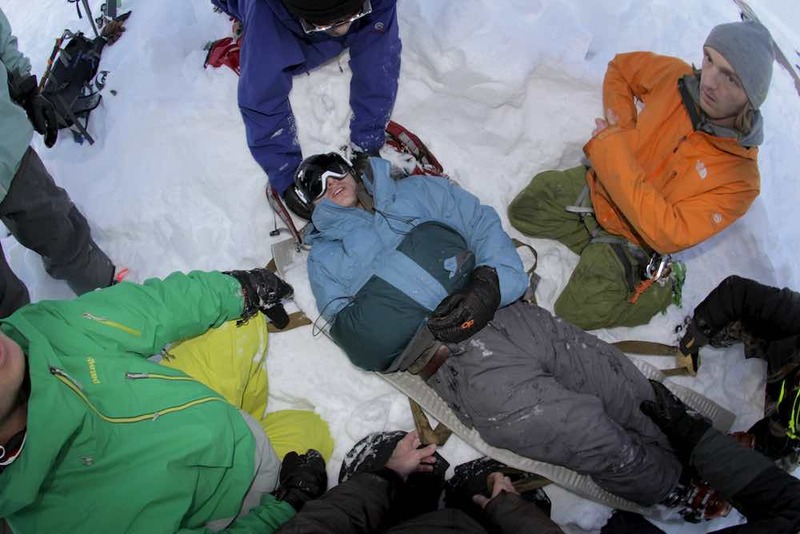 I think that a Wilderness First Aid (WFA) course is a great starting point to get some vital skills under your belt. I think that a Wilderness First Responder (WFR) is the ideal level of medical training for a vast majority of folks working in remote settings. Unless you are planning to work as an urban EMT or on a rescue service with ambulance equipment, the Wilderness Emergency Medical Technician (WEMT) is very often overkill. 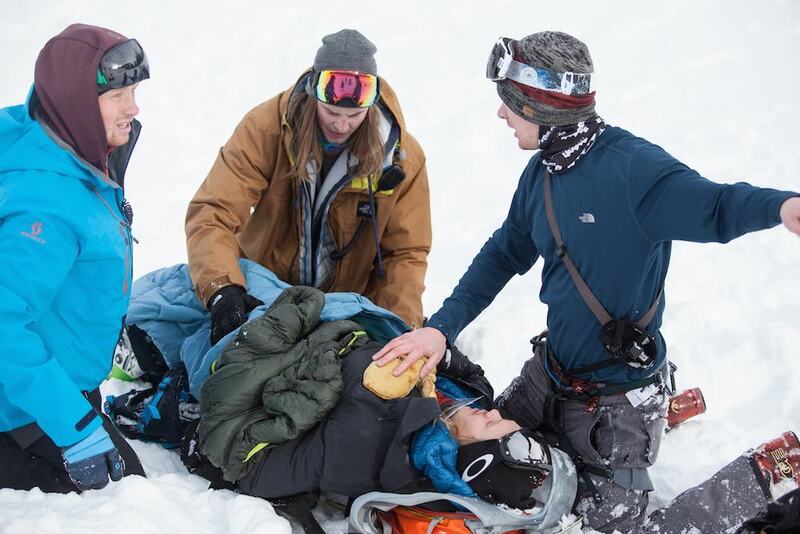 TGR athletes practice evacuating a victim on a rescue sled yesterday at Jackson Hole Mountain Resort. Leslie Hittmeier photo. I have had to drag a friend out in snowy terrain for about a mile before. It is an exhausting experience for sure, and would have been impossible without a patient with a high pain threshold and snow on the ground. If the patient is stable and can stay warm, I would recommend going to get additional people and gear resources to ease the evacuation on everyone. This is a common question. I think that the rescue membership systems in Europe work extremely well, but I also enjoy the fact that we don't have to pay for help in our country if we need it. The problem arises when people are negligent in the decision making that led to the evacuation or created a worse situation for rescuers after being hurt. That’s where I think that charging would be acceptable. Search And Rescue personnel assume some amount of risk every time that they respond to help others in addition to the large costs that the taxpayers incur, and I think that should be recognized, especially in the later situations when patients are blatantly responsible. Dane Tudor, Nick McNutt, and Blake Campbell practice communication while preparing a victim for extraction. Leslie Hittmeier photo. Great question. If you have the training, the practice, the protocols if working, have completed a good assessment of the injury and are in a wilderness context, then reduction of a shoulder dislocation can be beneficial to the patient and the evacuation. I don't want to go into techniques here, but will say that training and practice are key to differentiate when you should or should not consider dislocation reductions. Tim Durtschi demonstrating some proper belay techniques. Leslie Hittmeier photo. Similar to the medical kit question, I would say that you should purchase a ski rope that you will actually carry. If it is to heavy or bulky, eventually you will stop carrying it with you. A ski/rando rope with an 8 millimeter diameter and about 30 meters in length will do the trick in nearly all terrain that we ski/ride in. A full climbing rope is often dynamic, too heavy and is likely to absorb water (making it heavier). I wouldn't carry a full climbing harness on a regular basis. There are ways to improvise a harness out of webbing or sling material if needed in an emergency. 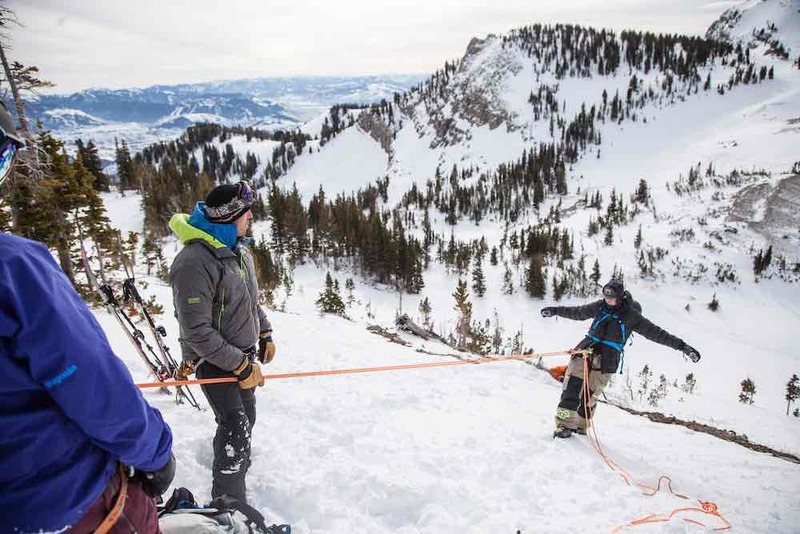 If you expect to wear a harness in avalanche terrain often, the Black Diamond Couloir harness is a great lightweight and highly packable option. 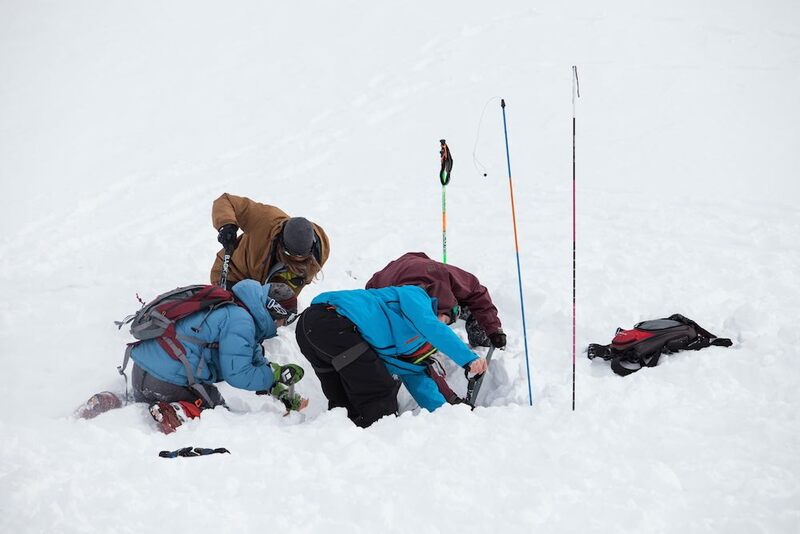 Four TGR team members practice shoveling out a victim after locating them with a probe at this week's International Pro Riders' Workshop. Leslie Hittmeier photo. I do think that persons of equal fitness and skill level will definitely be able to move more snow with a larger shovel blade. The length of the handle typically correlates to the comfort of a rescuer when shoveling (i.e. being able to stand, as opposed to hunched over or kneeling). I tend to carry a medium-sized shovel blade with extendable handle. I think that it will move a lot of snow when needed, carries nicely in my pack, allows for a sustainable stance, and is not so big that I fatigue easily when shoveling over an extended period. When running rescue scenarios, it becomes very apparent how much more snow a slightly bigger blade will move. A good practice is to place two probes to a certain depth mark in neighboring locations and then race your partner to the buried tip of the probe. This exercise will highlight the need for strategic shoveling techniques and also the difference in blade sizes for getting to a patients airway and chest efficiently. I think the answer is both. It is typically easier to access people from above in powder conditions, especially when on skis. It is also usually easier to work in powder when on a slope, as the patient tends to slide downhill less. When responding from below the patient or during evacuation on flat terrain, harder snow conditions are usually much more efficient for travel. Lexan or metal avalanche shovels? Lexan avalanche shovels are useless in actual avalanche debris. 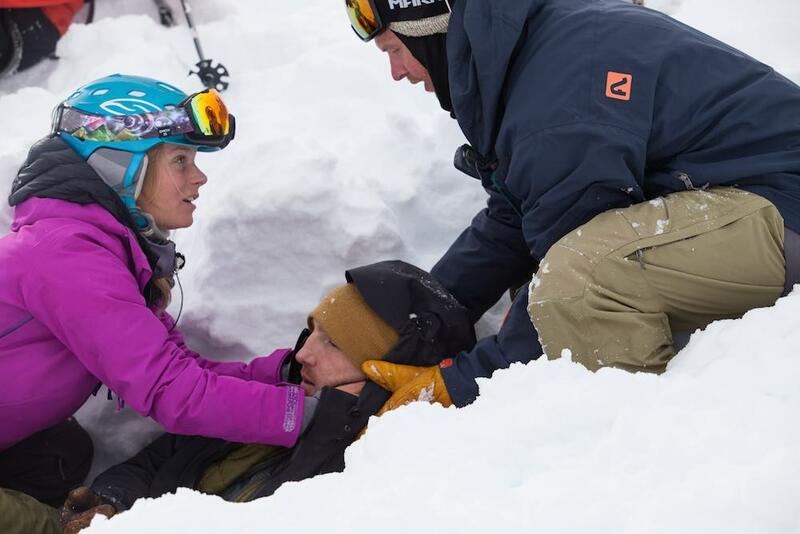 Angel Collinson and Dylan Hood practice stabilizing a victim this week in Jackson Hole. Staying calm yourself will keep your patient calm as well. Leslie Hittmeier photo. I would say that that the answer is all of the above. Patients, and rescuers, can be calm or in a panic, and everything in between those descriptors when on the scene. I think that the ultimate role of SAR personnel is to spread calm. When a scene feels chaotic, patient care and decision making suffer. A calm, organized rescue scene is the ideal. The majority of patients are very appreciative and at times even embarrassed that they needed to be helped. I think it is very important to take good care of all our patients and to treat them with respect. We never know when it will be our turn in the rescue sled as a patient. Great question. First, I think that it should be recognized that wilderness/remote/backcountry/austere/disaster medicine all refer to the same circumstances. Medical personnel are operating in less than ideal situations with minimal people and equipment resources. Now to answer your question directly. Often we are without some of the things that we would ultimately want to take care of our patients. Pain medication was your example and a very pertinent one. Musculoskeletal injuries can be extremely painful. Pain medication and sedation are often used to manage these patients and their pain in the front country setting. 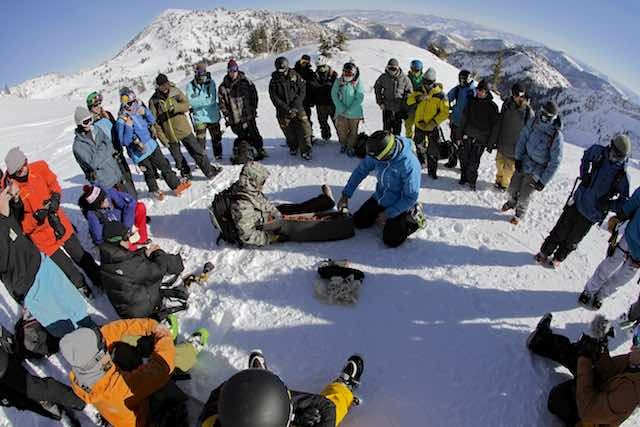 Even if we have them at our disposal in the backcountry (and in the urban environment), there are things we can do as providers that can help alleviate pain and anxiety. I think it starts with our calm demeanor and our competence as rescuers. Patients are affected by our approach to their situation, to say the least. Dave explains how to make an improvised leg splint out of a sleeping pad and a few strips of fabric during last year's IPRW. Ryan Dunfee photo. Letting patients know what we are doing and why can alleviate much of their anxiety and prepare them for the pain of movement or relocation of a dislocation. You said it perfectly regarding splinting. Minimizing the movement of an injury is one of the biggest steps we can take in helping manage discomfort. A rigid but padded improvised splint that immobilizes above and below the injury site is critical. Beyond that, I think that having a patient relax, take deep breaths and making them comfortable can only help. In the end, we want to do no further harm. So if the splint or the litter that we are using is having a negative impact, we need to stop and reassess our strategy. It's my understanding that the American Heart Association (AHA) has gone away from rescue breaths because: a. It's unlikely a bystander will give rescue breaths to a stranger; and b. research has shown compressions are much more important. However, this protocol assumes cardiac arrest patients in the urban environment, where a blocked artery is the underlying cause. I do not think you are off base here at all. You are correct regarding the rationale behind moving away from breaths during CPR by the AHA. Another factor in this decision was the proximity of EMS response in most urban jurisdictions. Research shows that patients do have residual oxygen in their system for a period of time after arrest and that the circulating of oxygenated blood (i.e. compressions) during a cardiac arrest is of prime importance. So in the urban setting for lay rescuers, calling 911 and doing compressions until EMS arrives and takes over makes a lot of sense. However, the AHA does still view breaths as important in urban cardiac arrest for professional providers regardless of mechanism. In the backcountry, because we don't often have the luxury of responding professionals, this line of reasoning is less relevant. I think it is telling that most wilderness medical education outfits continue to teach breaths as a component of their CPR curriculum. Textbook says we should leave all impalements in place unless they compromise the patient’s airway or breathing or could be a conduit for cold (i.e. ice axe, metal ski pole) and cause a life threat secondary to hypothermia. The justification for this answer is that the impaled object can be preventing or minimizing the bleeding from the trauma. Rescuers should stabilize all impaled objects in place to prevent unnecessary movement during evacuation. I am sorry to tell you, but neither one. Not getting caught in an avalanche is most important and the only silver bullet solution in avalanche terrain. There are situations when an airbag (i.e. treed terrain, big cliffs, etc) could make outcomes worse secondary to trauma. Likewise, for an Avalung to keep someone alive, they have to be able to get it in and keep it in their mouth. There is no piece of equipment that we can buy that is going to alleviate the problems associated with being caught in an avalanche completely. If money is tight, it is better spent on an avalanche course, a shovel, a beacon and a probe. If used in the proper situations, and they work, both the avalung and an airbag have their place.